Josef, one of nine children, was born in Duelmen, West Phalia on 30th June 1897. On leaving school, he began an apprenticeship with the Laumann Publishing Company, which today still produces the ‘Duelmen er Zeitung’, the local newspaper. Josef started military service on 4th May 1916, two years after his father had died, thus leaving his mother to maintain the rest of the family, through, running both a home and working at the general store. 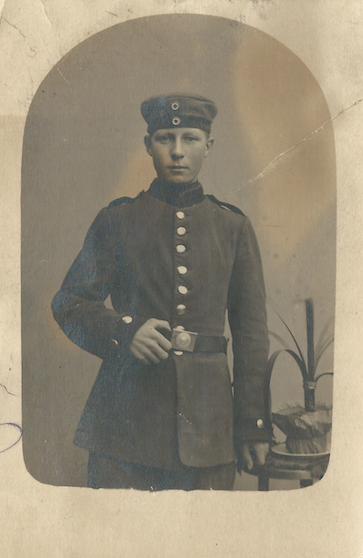 Josef was conscripted into the II Reserve Battalion Infantry Regiment, number 110, at Plankstadt - Schwetzingen District, Baden. He was, eventually, assigned to II Baden Guard, the Regiment of Kaiser Wilhelm I. His regiment was sent to the front on 23rd November 1916, as part of the 223rd Infantry Division commanded by General Major von Haevernick. 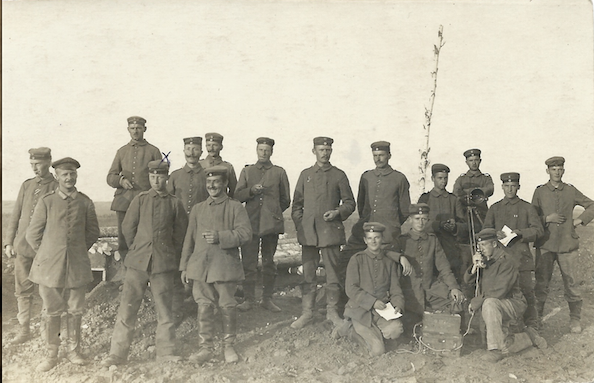 · 20th May – Regiment sent by train to Galicia, on the Eastern Front. · July – fought in Kerensky’s Russian offensive at Brzesain – Stanislaus. · August – engaged in Germany’s victory over the Russians at Galicia. Josef’s regiment remained involved in trench skirmishes at the Eastern Front, until the Russian – German Armistice on 15th December 1917. The’ Treaty of Brest – Litovsk’ was signed on 3rd March 1918. The new Bolshevik government had officially ended Russia’s participation in World War 1. Imperial Russia’s commitment to the Triple Entente was over. Josef was discharged from hospital in April 1918 and sent to the Western Front. At the beginning of May 1918, Josef’s new regiment, Reserve Infantry Regiment 29, saw action to the right of Nojon, before being directed to the Chemin des Dames, where on the on 28th May, it took part in the 3rd Battle of the Aisne, one of the last major German Offensives. On the first day the German Army had advanced 10 miles. This was the greatest gain of ground by one side since the ‘Race to the Sea’ battles, in 1914. By 30th May, the German Army was on the Marne River, 80 miles from Paris. Skirmishes followed in the trenches of Carlepont, in June, prior to them facing the counter offensive of the Allies between Pinon and Soissons; and again at the Chemin des Dames; where on 18th June 1918, Josef was awarded the Iron Cross, 2nd Class. Finally in September, within the last hundred days of the war, enduring the intense Allied advance at Laon, the Regiment withdrew, and was disbanded due to the heavy losses it had sustained. Musketier Josef Holiet was transferred to Regiment 170,52nd Infantry Division, in Flanders, where the regiment was engaged in the Meuse-Argonne Offensive, which proved to be a decisive American victory. By October, the Hindenburg Line was held by only 3 German fortified German lines. During the breaching of one of these, on 5th October, Josef was severely gassed during an unsuccessful German counter attack. This resulted in Josef being taken by a hospital train back to Germany, where he was admitted to the Osthofen Military Hospital near Worms. 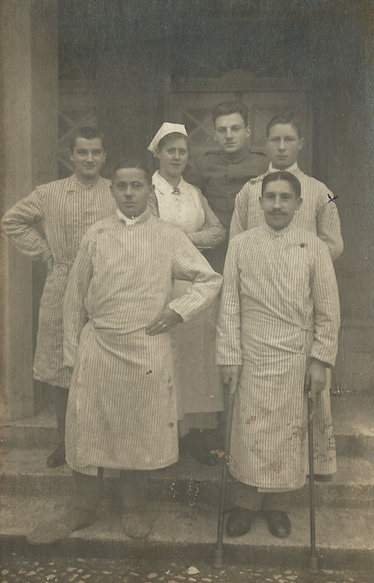 On November 8th Josef was reunited with other convalescing soldiers of his regiment stationed at Offenbach, Baden, from where he was discharged. He returned home on 18th November 1918. During his time as a soldier in World War 1, Musketier Josef Holiet served as a rifleman, light machine gunner and a telephone operator . All information kindly provided by Mrs Helga Clarke, Josef's daughter. Max, one of seven children, was born on 1st July 1898, in Monchengladbach. His 2 youngest sisters were to die in the Spanish Flu epidemic after the war. Before the war he was apprenticed to a weaving firm in Monchengladbach. In 1916, Max was called up to fight. He was assigned to the 3rd Battalion Reserves, Field Artillery Regiment 15. On 17th May 1917 Max’s father died. As a result all four sons were recalled, whilst fighting in France, to attend the funeral. All four brothers returned to the Western front and survived the war. However, Max lost his right arm on 19th October 1918, somewhere near the Deule Canal, the River Schelde region,north of Lille. Most likely, during the ‘Battle of Coutrai.’ For his action in the field,he was awarded the Iron Cross, 2nd Class. Max was taken to Lazarett (Military Hospital) 508, and then to Lazarett Hannover, from where he was discharged on 27th May 1919. He returned home to Mounchengladbach. 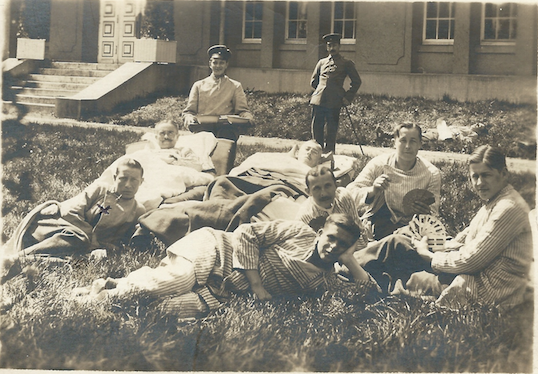 Due to Max being invalided in war, the German War Injured Association provided many opportunities for the men. Max never paid to use trams, buses or trains. His prosthesis limbs were provided for free. Every year he and his family enjoyed a holiday in a Spa Town, paid for by the state. Unfortunately, of course, he could no longer pursue his career in weaving. After the war, having learnt to write left-handed, he worked for Germany’s equivalent of the British Co-operative Society, gaining promotion to middle management. Max married Gertrude on 6th August 1928. They had 4 children;2 boys and 2 girls of which Greta is the youngest.